Shortly after his arrival with seven companions – at the point where the major east-west land route through the bogs of central Ireland along the Eiscir Riada, an esker left by the receding glaciers of the last ice age crossed the River Shannon – Saint Ciarán met Diarmait Uí Cerbaill who helped him build the first church at the site. This was a small wooden structure and the first of many small churches to be clustered on the site. Diarmuid was to be the first Christian crowned High King of Ireland. In September 549, not yet thirty-three years of age, Ciarán died of a plague, and was reportedly buried under the original wooden church, now the site of the 9th century stone oratory, Temple Ciarán. According to Adomnan of Iona, who referenced the testimony of earlier abbots of Iona who had known Columba, St Columba visited the monastery at Clonmacnoise during the time when he was founding the monastery at Durrow. While he was there he prophesied about the future debates in the churches of Ireland about the dating of Easter and claimed that angels had visited the monastery at Clonmacnoise. While he was there, there was a young monk named Ernéne mac Craséni (who would later be famous in Ireland) who tried to touch Columba's clothes while Columba was not looking, but the saint immediately noticed and grabbed the boy by the neck, and then told him to open his mouth and he blessed him, saying that he would teach the doctrine of salvation; the boy was Ernéne mac Craséni, who would later be a great monk in Ireland. Towards the close of the seventh century a plague carried off a large number of its students and professors. Clonmacnoise's period of greatest growth came between the 8th and 12th centuries. It was attacked frequently during these four centuries, mostly by the English (at least 40 times), the Irish (at least 27 times), the Vikings (at least 7 times) and Normans (at least 6 times). The early wooden buildings began to be replaced by more durable stone structures in the 9th century, and the original population of fewer than ten men grew to perhaps 1,500 to 2,000 by the 11th century. Although the site was based around a core of churches, crosses, graves and ecclesiastical dwellings and workshops, it would have been surrounded by the houses and streets of a larger secular community, the metalworkers, craftsmen and farmers who supported the monastic clergy and their students. Artisans associated with the site created some of the most beautiful and enduring artworks in metal and stone ever seen in Ireland, with the Clonmacnoise Crozier (on display in the National Museum of Ireland) and the Cross of the Scriptures representing the apex of their efforts. The Book of the Dun Cow a vellum manuscript dating to the 12th century, was written here. By the 12th century Clonmacnoise began to decline. The reasons were varied, but without doubt the most debilitating factor was the growth of the town of Athlone to the north of the site from the late-12th century. Athlone became the main trading town for the midlands of Ireland, the most popular route for crossing the Shannon, as well as the best-defended settlement in the region. People migrated north from Clonmacnoise to Athlone, and with the fall in population went much of the support that the site needed to survive, and former allies began to recognise the decline in the site's influence. The influx of continental religious orders such as the Franciscans, Augustinians, Benedictines, Cluniacs, etc. around the same time fed into this decline as numerous competing sites began to crop up. 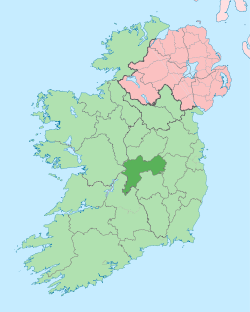 Ireland's move from a monastic framework to a diocesan one in the twelfth century similarly diminished the site's religious standing, as it was designated the seat of a small and impoverished diocese. In 1552 the English garrison at Athlone destroyed and looted Clonmacnoise for the final time, leaving it in ruins. The site includes the ruins of a cathedral, seven churches, two round towers, three high crosses and a large collection of Early Christian graveslabs. 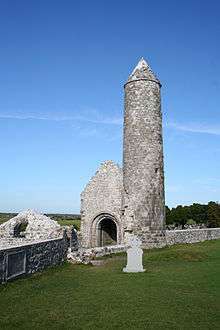 O'Rourke's Tower: Though named O'Rourkes' Tower, after 10th century Connacht king Fergal O'Rourke, the Chronicum Scotorum records that it was finished in 1124 by Turlough O'Connor, king of Connacht, and Gilla Christ Ua Maoileoin, abbot of Clonmacnoise. 11 years later it was struck by lightning which knocked off the head of the tower. The upper part of the tower is later work, so there is some speculation that the masonry thus toppled in the storm of 1135 may have been reused in the building of McCarthy's Tower. North Cross: Oldest of the three extant crosses. Created c.800. Only the limestone shaft and sandstone base (a former millstone) survive. The decoration is non-Christian, with an image of Cernunnos, the Celtic God of hunting and fertility, displayed on the east face of the shaft. 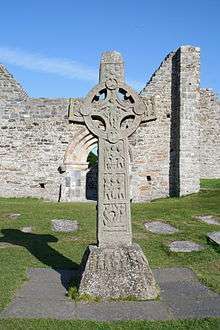 Cross of the Scriptures: This 4-metre high sandstone cross is one of the most skilfully executed of the surviving high crosses in Ireland, and of particular interest for its surviving inscription, which asks a prayer for Flann Sinna, King of Ireland, and Abbot Colmán who commissioned the cross. Both men were also responsible for the building of the Cathedral. The cross was carved from Clare sandstone c.900. The surface of the cross is divided into panels, showing scenes including the Crucifixion, the Last Judgement, and Christ in the Tomb. The original was moved into the visitors' centre in 1991 to preserve it from the elements; a replica stands at the original site. Cathedral (Temple McDermot): Building started around 909 by King Flann Sinna and Abbot Colmán mac Ailella. The west doorway has been recently (and somewhat controversially), comprehensively restored with the Gothic-style north doorway, often called the Whispering Arch, dating to the mid-15th century. The Cathedral is the largest of the churches at Clonmacnoise. Rory O'Connor, the last High King of Ireland, was buried near the altar in 1198, joining his father Turlough. Most of the graves currently seen in the church are those of the Coghlan family, whose patriarch extensively rebuilt the cathedral in the mid-seventeenth century. Temple Dowling: Originally built in the 10th century, this tiny church is named after Edmund Dowling, who renovated it in 1689, placing a stone carving of his family crest above the door. Temple Hurpan: Built in the 17th century at the east end of Temple Dowling, this annexe had no religious function outside of being a burial ground for some members of the local parish. Sometimes referred to as MacClaffey's Church. Clonmacnoise was handed over by the Church of Ireland to the Irish Government in 1955 and has been maintained by various departmental bodies since then. Currently the Office of Public Works manages the site on behalf of the Department of the Environment and Local Government. The current visitors' centre opened in 1993, replacing a wooden structure, and entry to the site is contingent on the payment of an entry fee seven days a week (from 1973–1985 a part-time guiding/interpretative service was maintained, which also required a small admission fee). The centre was designed to cater for a maximum of 80,000 visitors per annum; it attracted roughly 169,000 visitors in 2007 and 135,000 in 2010. Main features of the Interpretative Centre are exhibits depicting the history of Clonmacnoise and the area, archaeological artefacts (including the original stone crosses, brought indoors for preservation and display), information on the people who would have lived and worked there, and a section on the local ecology of the Shannon and the wetland bogs. Other amenities include a theatre for audio/visual presentations, a Fáilte Ireland tourist office, gift shop, tea room, toilets and parking. Guided tours of the site may be booked in advance for groups. AI548.1 Kl. Death of Mael at the hands of another person named Mael. Repose of Ciarán, son of the wright. Mael Odur [died] the same day. 994. Ódhrán Ua hEolais, scribe of Cluain-mic-Nois, died'", and "Irish: & Odhrán ua h-Eolais, scribhnidh Cluana Mic Nóis, d'ég". 1002: Flannchad ua Ruaidíne, successor of Ciarán, son of the artificer, of the tribe of Corca-Mogha, died. 1 2 3 "CATHOLIC ENCYCLOPEDIA: Abbey and School of Clonmacnoise". ↑ Monahan, John (1886). Records Relating to the Dioceses of Ardagh and Clonmacnoise. M.H. Gill and Son. p. 52. ↑ Adomnan of Iona. Life of St Columba. ed. Richard Sharpe. 1995, Penguin Books. ↑ Ryan, John (1 January 1976). Clonmacnois: a historical summary. Stationery Office [for] the National Parks and Monuments Branch, Office of Public Works. pp. 47–51. ↑ Dr.R.J.Quinn. "Clonmacnoise Bridge - AD 804". ↑ Tibus, Website design and development by. "Clonmacnoise - Monastic site - Attractions - Churches, Abbeys and Monasteries - All Ireland - Republic of Ireland - Offaly - Clonmacnoise - All Ireland - Republic of Ireland - Offaly - Shannonbridge - Discover Ireland". ↑ Graves, James (1864–66). "Proceedings". Journal of the Royal Society of Antiquaries of Ireland. 8: 109–113, 174–9. ↑ Flanagan, Marie Therese (2010). The Transformation of the Irish Church in the Twelfth and Thirteenth Centuries. Boydell & Brewer. pp. 172–174. ISBN 978-1-84383-597-4. 1 2 Ring, Trudy; Watson, Noelle; Schellinger, Paul (28 October 2013). Northern Europe: International Dictionary of Historic Places. Routledge. p. 180-182. ISBN 978-1-136-63944-9. ↑ Harbison, Peter (1 April 1995). Pilgrimage in Ireland: The Monuments and the People. New York: Syracuse University Press. p. 117. ISBN 978-0-8156-0312-2. 1 2 3 4 Davenport, Fionn (January 2008). Ireland. Lonely Planet. p. 364. ISBN 978-1-74104-696-0. 1 2 3 4 Colvert, Brendon K. (14 August 2014). CLONMACNOIS. Author House. pp. 17–18. ISBN 978-1-4969-8868-3. ↑ Archaeologia Cambrensis. W. Pickering. 2003. p. 7. ↑ Dunne, Michael; McEvoy, J. J. (January 2002). History and Eschatology in John Scottus Eriugena and His Time: Proceedings of the Tenth International Conference of the Society for the Promotion of Eriugenian Studies, [held At] Maynooth and Dublin, August 16-20, 2002. Leuven University Press. pp. 265–266. ISBN 978-90-5867-241-4. ↑ Marsh, Richard; Penn, Elan; McCourt, Frank (28 February 2006). The Legends & Lands of Ireland. Sterling Publishing Company Incorporated. pp. 141–142. ISBN 978-1-4027-3824-1. ↑ Fallow, Thomas McCall (1894). The Cathedral Churches of Ireland. Bemrose & Sons. Limited. p. 21. ↑ The Heritage of Clonmacnoise. Environmental Sciences Unit, Trinity College in association with County Offaly Vocational Educational Committee. 1987. pp. 30–32. ISBN 978-0-9512627-1-9. ↑ Monk, Michael A.; Sheehan, John (1998). Early Medieval Munster: Archaeology, History and Society. Cork University Press. p. 137. ISBN 978-1-85918-107-2. ↑ Monahan, John (1886). Records Relating to the Dioceses of Ardagh and Clonmacnoise. M.H. Gill and Son. p. 65. ↑ Somerville, Christopher (January 2007). Ireland. National Geographic Society. pp. 253–254. ISBN 978-1-4262-0022-9. ↑ The Journal of the Kilkenny and South-east of Ireland Archaeological Society. 8. Ireland Archaeological Society. 1867. p. 360. ↑ Williams, Howard; Kirton, Joanne; Gondek, Meggen (2015). Early Medieval Stone Monuments: Materiality, Biography, Landscape. Boydell & Brewer. p. 235. ISBN 978-1-78327-074-3. ↑ Kehnel, Annette (1997). Clonmacnois - the Church and Lands of St. Ciar'an: Change and Continuity in an Irish Monastic Foundation (6th to 16th Century). LIT Verlag Münster. pp. 33–40. ISBN 978-3-8258-3442-5. 1 2 "Clonmacnoise youth festival draws the crowds". Wikivoyage has a travel guide for Clonmacnoise. 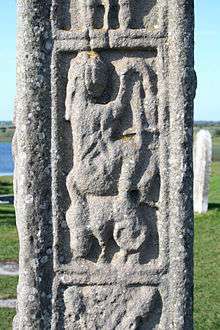 Wikimedia Commons has media related to Clonmacnoise.